Wharton's Minyuan Zhao and Matt Gold from Fordham University discuss what stands in the way of an effective trade deal between the U.S. and China. The U.S. decision on Wednesday to indefinitely postpone its plans to tame China with stiff import tariffs has certainly removed immediate fears of an escalating Sino-U.S. trade war that could be costly for both countries. The move allows breathing space for policy makers and trade negotiators on both sides to revisit the sticking points in the lingering disputes, especially those related to U.S. concerns over protection of intellectual property rights and China requiring U.S. companies to transfer technology if they want to access its domestic market of 1.4 billion. Although China has recently set up a specialized court in Beijing to deal with intellectual property rights, enforcement remains a key obstacle, and a deeper concern is a cultural disconnect over those rights between businesses in the two countries, according to experts at Wharton and Fordham University. The U.S. was set to increase tariffs from 10% to 25% on $200 billion worth of imports from China effective Friday, March 1, with the expiration of a 90-day suspension of tariff increases to allow for talks between the two countries. However, U.S. Trade Representative Robert Lighthizer told a House Ways and Means Committee meeting on Wednesday that the U.S. has called off that action, citing progress in the talks with China. Lighthizer reasoned that the two countries have reached “a tentative agreement on a mechanism to enforce the trade deal, which has long been a stumbling block in talks,” the Wall Street Journal reported. He added that if the talks fail, the U.S. would impose the higher tariffs. President Donald Trump indicated over the weekend that the U.S. was willing to extend the deadline for imposing the higher tariffs beyond March 1. In the first of two tweets on Sunday, he cited progress in talks with China on issues including IP protection, agriculture and currency rates. He added that assuming both sides make progress on continuing talks, he would “conclude an agreement” at a summit with Chinese president Xi Jinping at his Mar-a-Lago resort in Florida. Trump’s primary goal in delaying the tariff increases is to avoid spooking the stock markets, according to Matt Gold, adjunct law professor at Fordham University and a former deputy assistant U.S. trade representative for North America. “He just doesn’t want to do it because of the negative impact it will have on stock markets, which is the only real and objective indicator of his presidency that has been positive,” he said. “We don’t know if he really has a basis for this extension or not.” Trump also wants to stamp a future agreement as “his,” by announcing it at his Mar-a-Lago resort, Gold added. As it happens, the Dow Jones rose after Trump’s announcement, but fell after Lighthizer’s comments on Wednesday as the markets sensed uncertainty in his hints that a trade deal was not certain, according to a CNBC report. According to Wharton management professor Minyuan Zhao, tariffs of 25% on imports from China “would be devastating for both parties.” Not only would Chinese exporters find their profits squeezed, they would also defer investments amid the uncertainty in the trade environment, she said. Zhao agreed with Gold, but put a historical and cultural perspective to the risks IP rights face in China. IP thefts have been rampant in China for a long time, and the thinking behind that is, ‘If I see something good, I want to do it, too,’ said Zhao. However, the Chinese government is taking corrective action, she added. In January, China set up a specialized IP court in Beijing. More generally, multinational companies have of late had easier access to the court system enforcement of laws as well, she noted. One troublesome gray area is “state-led learning,” or the indigenous innovation push in China. State-owned enterprises in China compel MNCs that want to tap the Chinese markets to part with their technical knowhow in what has been termed as “forced technology transfer.” Twenty years ago, Chinese companies wouldn’t even have bothered to inform their MNC partners about their plans for such technology transfers – “they just take it and start producing,” said Zhao. “The fact that there’s more negotiation means the concept of IP is established now [in China]. But the state is in such a dominant position that they can [compel] companies into this seemingly mutual agreement of technology transfer.” Beyond the risks to protection of IP rights, the larger threat to MNCs operating in China is its state-dominated development model where it has “the discretion” on how to pursue its IP goals, she added. On issues outside of IP rights, China and the U.S. might find more room for agreement. In agriculture, for instance, China would be ready to import more soybeans from the U.S., Zhao said. “China needs it and the U.S. is the cheapest and highest-quality provider of the product,” she said. China has some concerns over being overly dependent on imports of agricultural products from the U.S., she added. Although China’s actions on IP rights violated WTO rules, the Trump administration chose to bypass the WTO dispute resolution process, and “retaliated against China outside that process,” Gold said. He noted that the insistence of the U.S. Trade Representative (USTR) on a separate enforcement mechanism also ignores the WTO’s own enforcement mechanisms. Instead of unilaterally imposing higher tariffs on imports from China, the Trump administration could have achieved its objectives through the WTO mechanisms, said Gold. “[Trump] would have had the opportunity to impose the exact same tariffs if he had gone through the WTO dispute resolution process,” he added. “He just would have had to prove his case before a WTO panel and then prove it again before the WTO appellate body before getting permission. It would have taken three or four years.” The U.S. acted in a similar fashion when it levied tariffs last June on steel and aluminum imports from Canada, Mexico and the European Union, he added. The U.S. has on occasion dragged China to the WTO over alleged trade improprieties. Earlier on Thursday, the USTR announced that a WTO dispute settlement panel found that “China has provided trade distorting domestic support to its grain producers well in excess of its commitments under WTO rules.” The case dates back to December 2016, when the USTR had asked the WTO to consider whether China provides “market price support” for certain varieties of rice, wheat and corn in excess of its domestic support commitments. “This panel report is a significant victory for U.S. agriculture that will help American farmers compete on a more level playing field,” the USTR stated. Trade agreements are of course worthless if they are not implemented. “It’s one thing to write down the terms and the conditions; it’s another thing to think about enforcement,” said Zhao. The reality is that China would use the power of its state to maximize its growth prospects, she noted. It is imperative to have agreement in terms of how the legal framework will take root in China and ensure enforcement of laws, she said. According to Zhao, U.S.-China negotiations are not just about trade, but also have longer-term implications on the “development models” China adopts. She noted that the trade talks would outline the restrictions China might face in pursuing its development model, which includes the Made in China 2025 program to move towards becoming a producer of high-end goods with appropriate investments in R&D, including in information technology, robotics and clean energy. One sure-fire winner will emerge from the mess that is financial benchmark reform: lawyers. It is hard to imagine an overhaul of market infrastructure more suited to their needs as this process lumbers towards an inevitable flurry of disputes. Bankers will cop the blame, naturally. But for once, perhaps, the mess is not really their fault. At issue is Libor, the benchmark borrowing rate that is embedded in everything from floating-rate debt to derivatives to mortgages and anything in between. The rate touches the most sophisticated hedge funds and the average homeowner. But the order has come down from on high: Libor, in all its different currency forms, must die. Some of the reasons for this death sentence from regulators are obvious; abuse of the methods for calculating interbank borrowing rates has landed people in jail. It turned out, to the shock of people who were naive or not paying attention, that leaving traders to set a rate from which they can profit based on numbers they plucked out of thin air, is a bad idea. The skulduggery that led to the sprawling Libor scandal is only part of the problem, however; authorities are keen for a new rate to be based on something that is traded. The “thin air” element needs to be removed so the rate cannot be so easily gamed, but it is also common sense. The problems have set in already with the implementation of a new regime. Even the New York Fed’s general counsel Michael Held this week referred to the mess as “a defcon 1 litigation event if ever I’ve seen one”. In late January, Edwin Schooling Latter, director of markets at the UK’s Financial Conduct Authority, said in a speech that the “best and smoothest transition away from Libor will be one in which contracts that reference Libor are replaced or amended” before the rate disappears, which it wants to see by the end of 2021. This matters. Imagine you hold a floating-rate note, which you have bought specifically to help hedge against inflation. Its returns track Libor. But Libor dies. So the interest payments stick at the last published rate for ever. That burns the investor if the underlying rate rises. But it is a windfall for the borrower. “This is not a very satisfactory solution to either the issuers or the borrowers,” said New York Fed’s Mr Held, adding that for derivatives, “there simply may be no further fallback. You can imagine the litigation risk when the reference rate for a 20-year contract disappears and there’s no clear path to replace it. Now imagine $190tn worth of those contracts”. It all “invites litigation . . . on a massive scale”, he said. It would help here if every stakeholder had formed a plan of action. But they have not. Far from it. The FCA has, with the best of intentions, really dug in. Chief executive Andrew Bailey has turned up the volume on his warnings that banks must abandon the old rate. The Bank of England has backed him up. But how? Banks must sort it out between themselves. There will be no legislation to force all stakeholders to make the leap — a silver bullet that would solve most of the problems. The unwillingness of national authorities to set out a solution is leading to exasperation. In a perfect world, Sonia, and Sofr in the US, would now form the basis of new derivatives and new products that banks can use to keep hedging existing Libor-based contracts. But that is all more easily said than done. The likely replacements for Libor, a so-called “term” instrument that locks in prices for three or six months at a time, are generally overnight rates. This is an effort to cram square pegs into round holes. Bankers say they are doing what they can to explain the difficulties to regulators, as are industry bodies. But banks are worried that their motives are doubted and their concerns are unheeded. In the months before the big switch-off, they are doing what they can to educate clients and drum up liquidity in new benchmarks. They are also mentally preparing themselves for legal battles with clients stretching out for years. THE ARMIES of India and Pakistan often exchange fire across the front line in the disputed state of Kashmir. When tensions rise, one side will subject the other to a blistering artillery barrage. On occasion, the two have sent soldiers on forays into one another’s territory. But since the feuding neighbours tested nuclear weapons in the late 1990s, neither had dared send fighter jets across the frontier—until this week. After a terrorist group based in Pakistan launched an attack in the Indian-controlled part of Kashmir that killed 40 soldiers, India responded by bombing what it said was a terrorist training camp in the Pakistani state of Khyber Pakhtunkhwa. Pakistan retaliated by sending jets of its own to bomb Indian targets. In the ensuing air battle, both sides claim to have shot down the other’s aircraft, and Pakistan captured an Indian pilot. A miscalculation now could spell calamity. The fighting is already the fiercest between the two countries since India battled to expel Pakistani intruders from high in the Himalayas in 1999. The initial Indian air raid struck not Pakistan’s bit of Kashmir, but well within Pakistan proper and just 100km from the capital, Islamabad. That, in effect, constituted a change in the rules of engagement between the two (see article). India and Pakistan are so often at odds that there is a tendency to shrug off their spats, but not since their most recent, full-blown war in 1971 has the risk of escalation been so high. The intention of Narendra Modi, India’s prime minister, in ordering the original air strike was simple. Pakistan has long backed terrorists who mount grisly attacks in India, most notably in Mumbai in 2008, when jihadists who arrived by boat from Pakistan killed some 165 people. Although Pakistan’s army promised then to shut down such extremist groups, it has not. By responding more forcefully than usual to the latest outrage, Mr Modi understandably wanted to signal that he was not willing to allow Pakistan to keep sponsoring terrorism. In the long run, stability depends on Pakistan ending its indefensible support for terrorism. Its prime minister, Imran Khan, is urging dialogue and, in a promising gesture, was due to release India’s pilot—presumably with the approval of the army chief, who calls the shots on matters of security. But in the short run Mr Modi shares the responsibility to stop a disastrous escalation. Because he faces an election in April, he faces the hardest and most consequential calculations. They could come to define his premiership. Mr Modi has always presented himself as a bold and resolute military leader, who does not shrink from confronting Pakistan’s provocations. He has taken to repeating a catchphrase from the film “Uri”, which portrays a commando raid he ordered against Pakistan in 2016 in response to a previous terrorist attack as a moment of chin-jutting grit. The all-too-plausible fear is that his own tendency to swagger, along with domestic political pressures, will spur him further down the spiral towards war. The ambiguity of Mr Modi’s beliefs only deepens the danger. He campaigned at the election in 2014 as a moderniser, who would bring jobs and prosperity to India. But, his critics charge, all his talk of development and reform is simply the figleaf for a lifelong commitment to a divisive Hindu-nationalist agenda. Over the past five years Mr Modi has lived up neither to the hype nor to the dire warnings. The economy has grown strongly under his leadership, by around 7% a year. He has brought about reforms his predecessors had promised but never delivered, such as a nationwide goods-and-services tax (GST). But unemployment has actually risen during Mr Modi’s tenure, according to leaked data that his government has been accused of trying to suppress (see article). The GST was needlessly complex and costly to administer. Other pressing reforms have fallen by the wayside. India’s banks are still largely in state hands, still prone to lend to the well-connected. And as the election has drawn closer, Mr Modi has resorted to politically expedient policies that are likely to harm the economy. His government hounded the boss of the central bank out of office for keeping interest rates high, appointing a replacement who promptly cut them. And it has unveiled draft rules that would protect domestic e-commerce firms from competition from retailers such as Amazon. 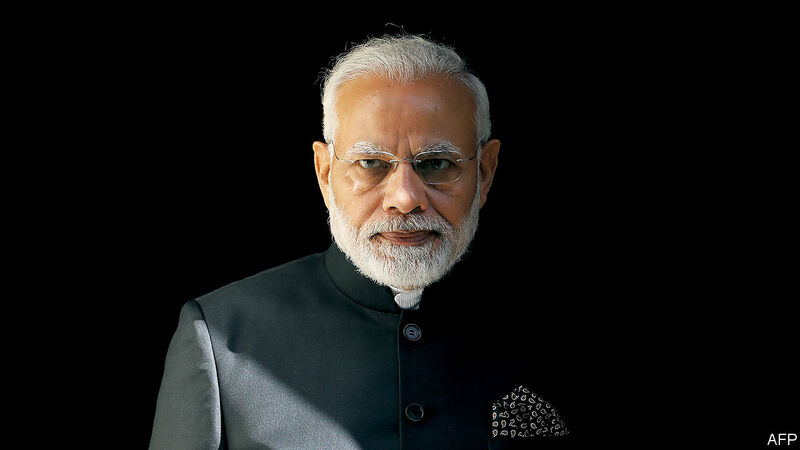 By the same token, Mr Modi has not sparked the outright communal conflagration his critics, The Economist included, fretted about before he became prime minister. But his government has often displayed hostility to India’s Muslim minority and sympathy for those who see Hinduism—the religion of 80% of Indians—as under threat from internal and external foes. He has appointed a bigoted Hindu prelate, Yogi Adityanath, as chief minister of India’s most populous state, Uttar Pradesh. A member of his cabinet presented garlands of flowers to a group of Hindu men who had been convicted of lynching a Muslim for selling beef (cows are sacred to Hindus). And Mr Modi himself has suspended the elected government of Jammu & Kashmir, India’s only Muslim-majority state, and used force to suppress protests there against the central government, leading to horrific civilian casualties. As reprehensible as all this is, the Hindu zealots who staff Mr Modi’s electoral machine complain that he has not done enough to advance the Hindu cause. And public dissatisfaction with his economic reforms has helped boost Congress, the main opposition party, making the election more competitive than had been expected. The temptation to fire up voters using heated brinkmanship with Pakistan will be huge. Mr Modi has made a career of playing with fire. He first rose to prominence as chief minister of Gujarat when the state was racked by anti-Muslim pogroms in 2002. Although there is no evidence he orchestrated the violence, he has shown no compunction about capitalising on the popularity it won him in Hindu-nationalist circles. With a difficult election ahead, he may think he can pull off the same trick again by playing the tough guy with Pakistan, but without actually getting into a fight. However, the price of miscalculation does not bear thinking about. Western governments are pushing for a diplomatic settlement at the UN. If Mr Modi really is a patriot, he will now step back. MSCI is raising the portion of China A-shares in its EM index. That doesn’t give investors carte blanche to snap them up. MSCI MSCI 2.20%▲ has decided to quadruple the weighting of Chinese stocks included in its flagship Emerging Markets Index. Investors shouldn’t take this as an invitation to pile into China without thinking. The index industry giant’s original 2017 move to include some so-called A-shares came with plenty of fanfare. In practice, emerging markets investors who benchmark their performance against MSCI’s index were safely able to ignore the move. Initial weightings meant Chinese shares made up less than 1% of the EM index, slightly below the share of Poland: Whether domestic Chinese shares boomed or crashed has hardly mattered to the index’s performance. Studied ignorance will be a less viable option from now on. 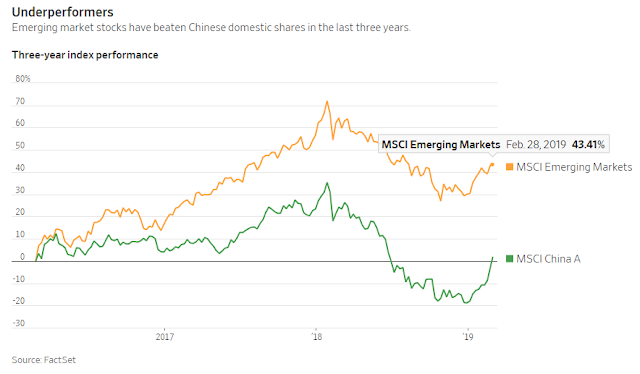 The changed weighting of Chinese stocks in the emerging markets index will bring their share of it to around 3.3% by November 2019, giving it a share somewhere between Mexico’s and Russia’s. Index provider MSCI said it would more than quadruple the weighting of mainland Chinese companies in an influential global benchmark. As that share rises, Chinese stocks will become harder for conservative asset allocators to avoid. Managers who try not to deviate far from their performance index—known as benchmark huggers—will end up buying increasing amounts of A-shares. But asset managers lazily sticking to an index while charging their clients steep fees shouldn’t get a pass for making poor investment decisions. Research published last year by MSCI itself showed that active managers in emerging markets have greater potential to outperform indexes, in part because the inefficiency of those countries’ capital markets puts a higher premium on stock picking. The logic for index-hugging in developed markets is stronger: there at least, actively managed funds have overwhelmingly underperformed their passive peers over time. By admitting more shares from places such as China into their indexes, providers like MSCI are simply judging that the way their markets operate meets minimum standards. The decision reveals nothing about whether they stocks are a good buy. 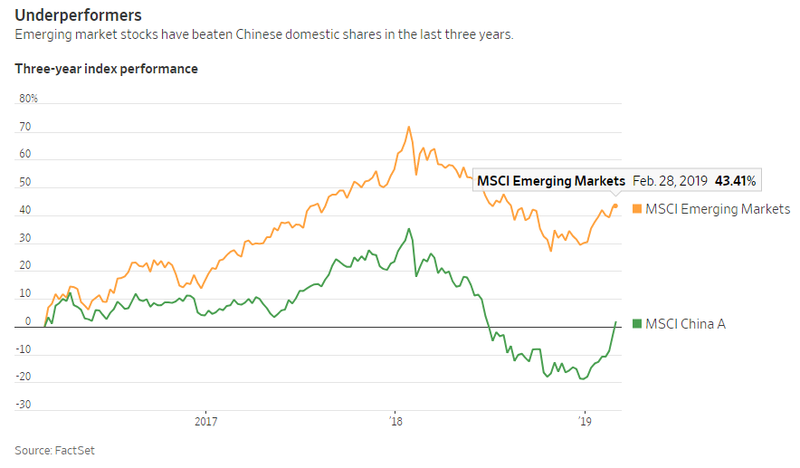 The fact that MSCI’s A-Shares Index has underperformed the broader EM index by almost 30% over the past three years should give pause to those who think Chinese stocks simply track the asset class. If investors want to make a greater allocation to China, they should find a better pretext than MSCI’s decision.